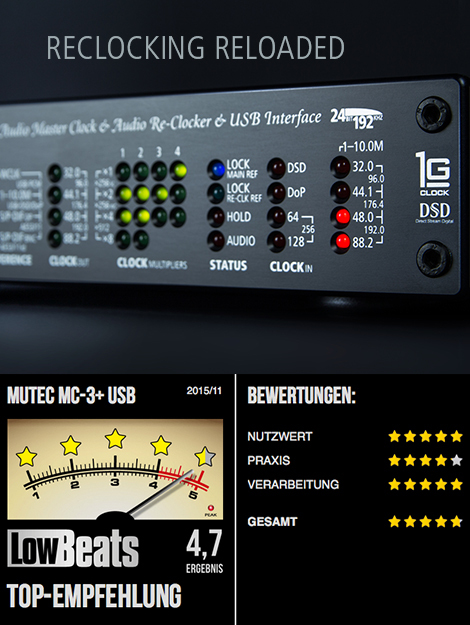 It’s a world premiere on LowBeats: the highly anticipated MC-3+ Smart Clock USB by Berlin specialist MUTEC is the logical follow-up to the exceptional word clock generator /re-clocker MC-3+ we recently reviewed. As the name suggests, this latest creation by the Berlin based manufacturer now includes a USB port – making it significantly more interesting for all audiophile computer audio aficionados. 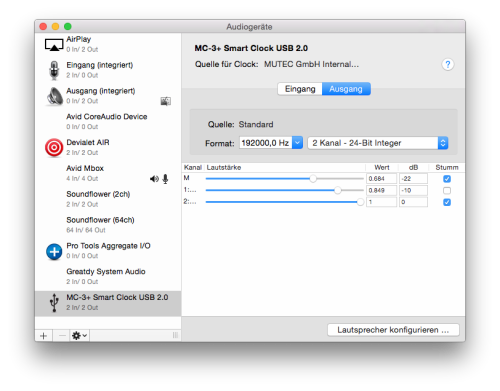 MUTEC however didn’t settle for simply adding a USB input to the MC-3+: instead the MC-3+USB was actually developed from the ground up building on the proven benefits of the MC-3+, which continues to be sold in its own right. 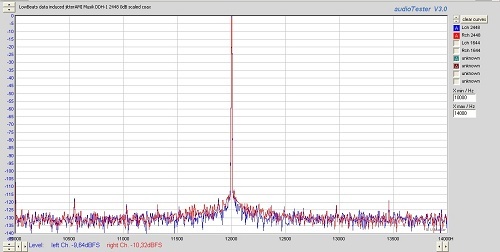 Just like its predecessor the MC-3+USB also features MUTEC’s proprietary, ultra precise, lowest jitter clock generator based on the so-called direct digital synthesis (DDS). What’s new is that this clock technology is now available for locking to incoming digital signals via USB and re-clocking them entirely to reduce jitter to its absolute minimum. 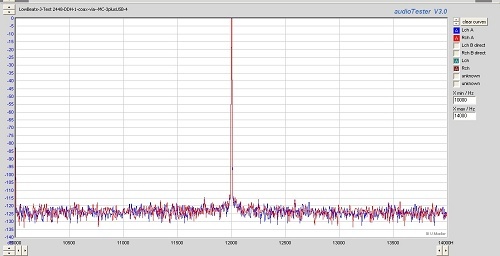 The same is true the other way around: AES3 or S/P-DIF signals received by the unit will also be most accurately re-clocked and transferred by to the computer via the USB interface. Picture 1: Thanks to its USB-B socket the MUTEC MC-3+ is particularly well suited for audiophile applications. Since potential jitter doesn’t have an immediate impact on audio in the digital domain, the re-clocking of inbound audio signals when transferring strictly to the computer is not a necessity. Nonetheless it does provide a useful solution for simultaneously monitoring the re-clocked signal on any of the other audio inputs to make sure that the computer is properly locking to the asynchronous USB signal. At this point, one limitation of the device has to be mentioned that may be important for a few users: while the MC-3+USB provides bidirectional data transfer via USB to a computer and back, it doesn’t do so at the same time. The re-clocking circuitry can either be used for playing back from the computer or to record audio into the computer (half-duplex mode). If the re-clocking feature is deactivated, the device will simply transmit blank frames without audio data to the computer for locking purposes (word clock generator mode). 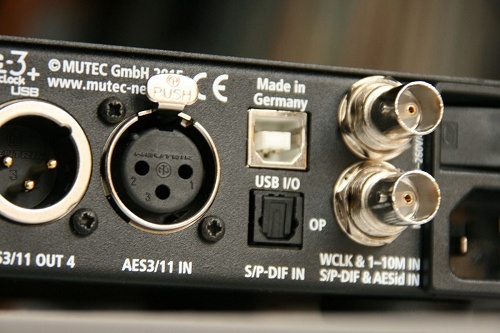 So the MC-3+USB can only partially substitute a bidirectional, full-duplex capable digital interface like the MUTEC MC-1.2, which would allow simultaneous playback and recording with a computer. Maybe MUTEC can be convinced to add the possibility of using the record path without the re-clocking feature with a future firmware update? Since the MC-3+USB is a so-called digital-digital converter (DDC, or simply digital format converter) that doesn’t come with its own D/A converter (DAC), conversion into the analog domain has to take place via an external DAC. While the DAC doesn’t need to have its own USB input, it will need to have an AES3 or S/P-DIF (coax and/or optical) input, as these are the digital formats the unit provides after the USB re-clocking has taken place. 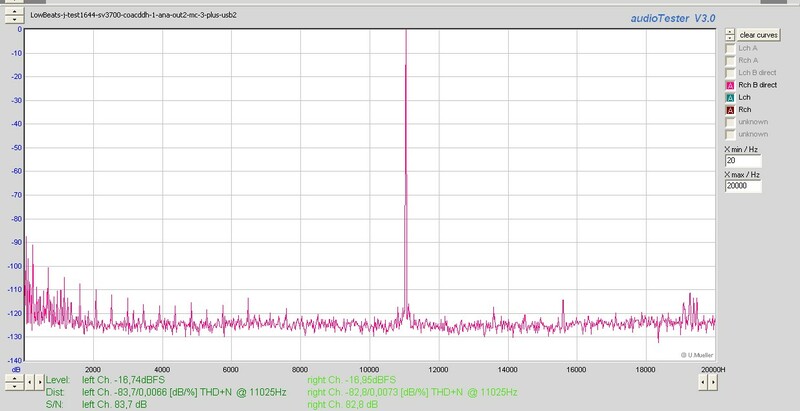 Equally as useful, it is of course possible to re-clock other S/P-DIF signals, from a CD transport for example, and output them for the DAC via S/P-DIF or AES3. 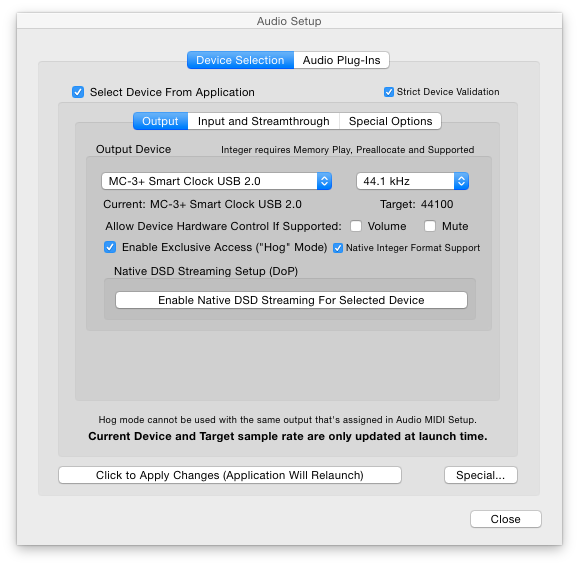 The term "format converter" is true in two respects anyway: it cannot simply be used as a bidirectional format converter between S/P-DIF and AES3, but it is even capable of converting native DSD streams injected via USB to PCM audio thanks to its integrated hardware conversion. 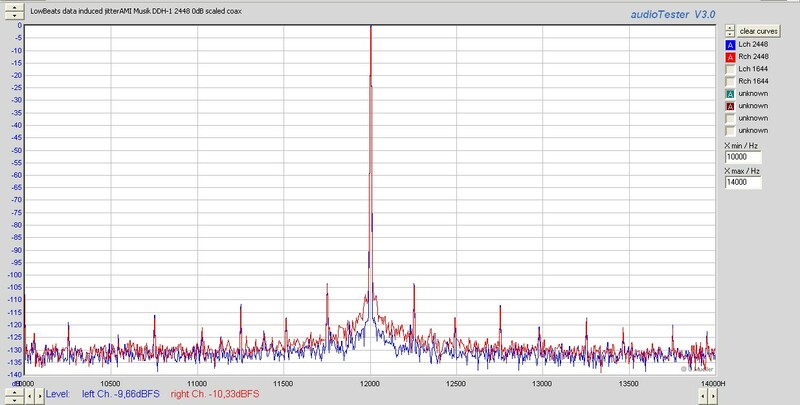 Accepted formats are DSD 64, 128 and (pending a future firmware update soon to follow) even 256, while the output sampling rate may be adjusted between 44.1, 88.2, and 176.4 kHz. Just like its previously reviewed sibling, the MC-3+USB can be used as an ultra precise, master word clock generator in recording studio environments. 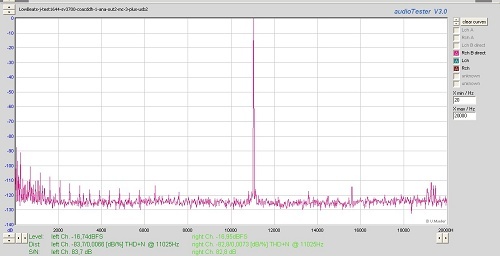 While doing so, it can either lock to its internal system clock or sync to external references via BNC with clock frequencies between 1-10 MHz. Because of its other available BNC connectors the MC-3+USB provides only four BNC outputs instead of the six outputs on the MC-3+, which nonetheless should be plenty for most applications. Still it is possible to set each of the four clock outputs to multiples of the base clock rate independently: the currently selected multipliers of the base rate will be indicated with LEDs on the front panel. Picture 2: The rear panel has been filled to last fraction of an inch and is fully loaded. Coax S/P-DIF input is only possible via BNC (bottom right), which may require an additional RCA-to-BNC adapter depending on the available cable. Digital audio gurus Ed Meitner (EMMLabs) and Robert Gendron (Analog Devices) already reported in 1993 that lighting fast switching noise by the logic ICs induced into the power supply rails to other digital signal processing building blocks can be one of the many possible causes for jitter problems. This effect is called "logic induced modulation" (LIM). In order to avoid any potential LIM pitfalls from the start, MUTEC has developed a unique power supply concept for the MC-3+USB that features independent circuit blocks and cutting-edge voltage regulators. The USB circuit is galvanically isolated from other sections of the circuitry to eliminate potential noise interference caused by the computer. As the measurement diagrams below show, these efforts have certainly paid of: the MUTEC MC-3+USB not only significantly improves the jitter performance of D/A converters with the re-clocking mode, it also does so even more thoroughly (figure 3) than its already excellent sibling (figure 2). Almost blatant is the positive effect of the MC-3+USB when using it in conjunction with jitter-heavy sources. In figure #4, I was testing the arguably most widely available professional DAT recorder SV-3700 by Panasonic as a signal source. 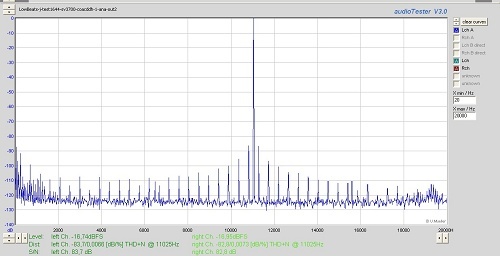 The diagram shows strong jitter-induced noise components near the 11.025 kHz test signal. When inserting the MC-3+USB these components will be reduced by more than 35 dB to a nearly nonexistent level. 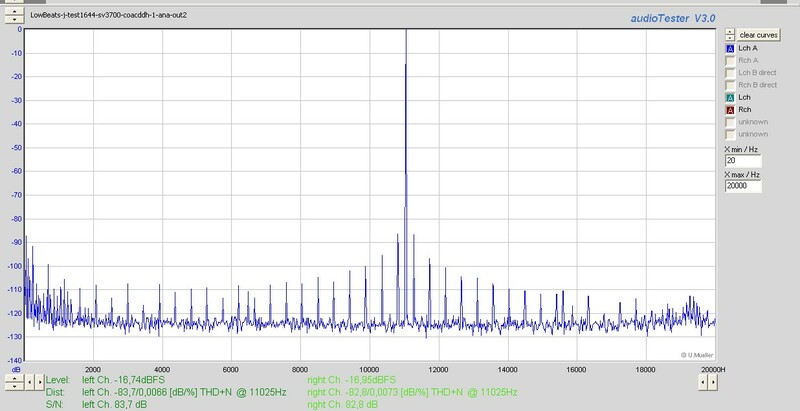 The remaining spectral components in the lower frequency range around 8 kHz are not jitter related, but instead are caused by the finite resolution of the 16 bit test signal – thus they are to be expected. Connected D/A converters can however only profit from the re-clocking technology if their internal phase-locked-loop (PLL) circuitry will properly lock to the pure clock signal from the MC-3+USB. 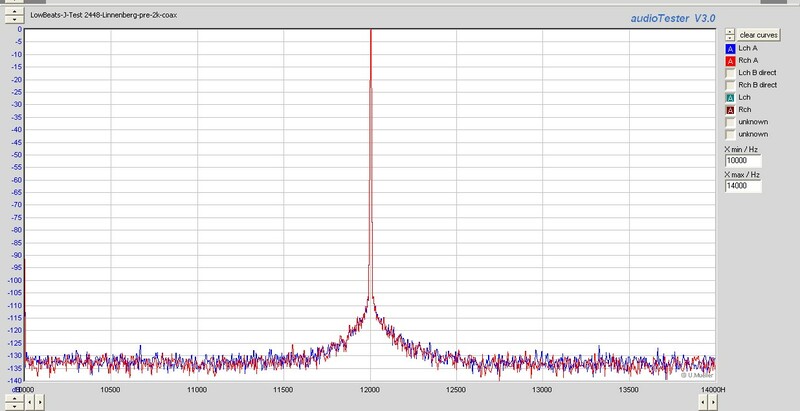 DACs that completely decouple their internal clock rate from incoming signals using an asynchronous sample rate converter (ASRC) will not benefit as much or possibly at all as shown in figures #6 and #7. It does have to be said that, out of my own curiosity, I tested a slightly outdated DAC for this worst-case measurement, which utilizes the notorious ASRC chip CS 8420 by Cirrus Logic. Before getting to the sonic impact that the MUTEC MC-3+USB is able to provide, let’s start with some practical considerations: those that would like to operate the MC-3+USB with a Mac computer should have a look at the "Audio & MIDI Setup" application (screenshot below) as part of the system utilities toolkit prior to their initial tests with the device. Upon launch of the application please browse to the audio dialog and click "outputs". Now you’ll see three blue faders below. Make sure these are set to full volume, i.e. all the way to the right, as this will give you the maximum output level at the given bit depth, which will hence provide the best audio performance. Not every hardware and software will support this option of user level controls. If you want to ensure that the level controls have not accidentally been set to a lower level, you will need to activate "Exclusive Access" ("Hog"-Mode) in your software player setup: this setting will automatically set and lock the faders to their maximum. If you are planning on using the MC-3+USB for recording with computer, also check the input options: these fader controls should equally be set to their respective maximum values. 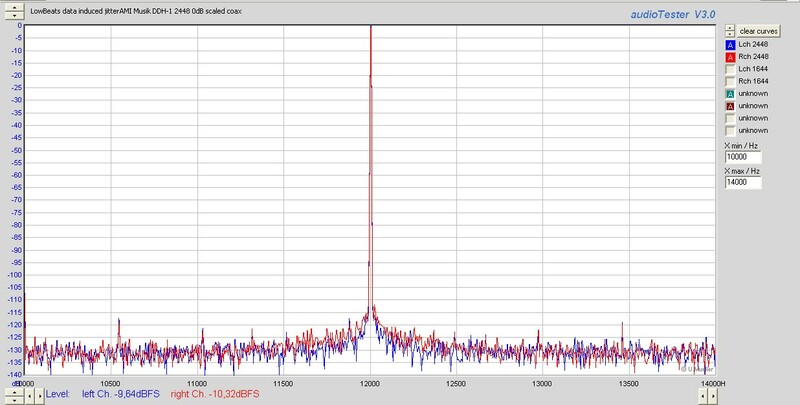 Because external D/A converters will react to a jitter-affected digital signal in different ways, I decided to test the MC-3+USB in conjunction with a wide selection of equipment – ranging in price from very affordable to quite exclusive. What I found as a surprise was that the effect of the re-clocking, while varying in its magnitude, was still pronounced in combination with devices with extremely sophisticated clock regeneration, such as the superb AMR DP777. This was even true for my most favorite active loudspeaker system Grimm LS1, although their developers without a doubt must be some of the most experienced clock technology specialists. As a general rule I try to stay away from specific listening examples and focus on a more general sonic description that is more easily transferred to a subjective music preference. This is usually quite effective, because most components or loudspeakers will exhibit a clear character or just a few specific sonic traits. 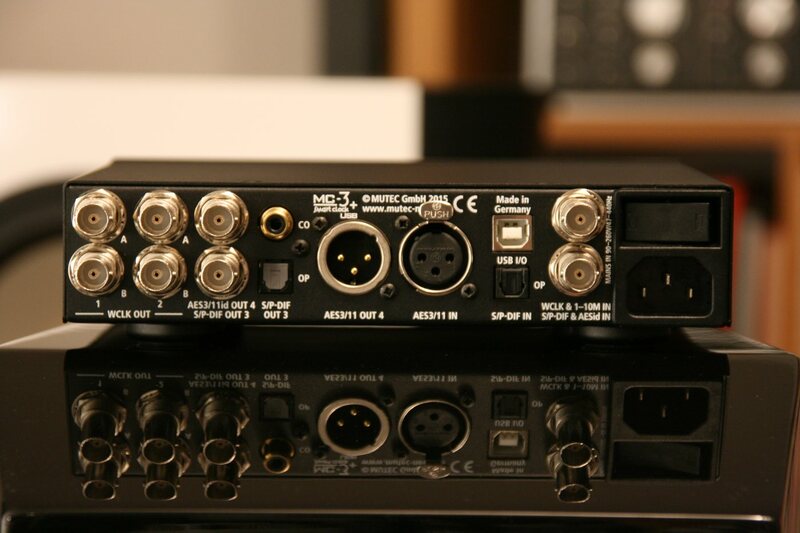 The influence of the MUTEC MC-3+USB however could not be locked down to a specific, one-dimensional aspect: sometimes it was Dusty Springfield’s voice in The Look Of Love from Burt Bacharach’s all-time classic Casino Royale that managed to sit more pronounced in its musical surrounding – sometimes it was the reverb tail of the clave in Hold You Back from Mashti & Jean Von Baden, which extended further into the room – then again it was the more precisely accentuated groove in Soul Makossa by Manu Dibango, where the emphasized second beat of the kick drum translated noticeably stronger, just like one would wish for. After several days and equally as many configurations of equipment I did after all notice a sonic character trait that framed all the listening tests: the MUTEC MC-3+USB has the unusual capability to render solo instruments and voices with particularly more detail, making it possible to follow lead melodies exceptionally well. This is not achieved by an increase of virtual volume or loudness, but rather by means of a kind of spatial focus – the defining sounds prominently take center stage while the supporting elements are actually tucked underneath or further back. The acoustic scene seems to be more spread out and more detailed, but by no means harsh, rather more accurate and fine. This was particularly noticeable with Et dieu pour tous on Florent Campana’s fantastic, equally titled album: the bell-like electric piano lead melody radiantly stood above everything else, whereas the soft, delicate ambient samples in background were carved out like rarely ever before. For those that love a compact sound stage this listening experience may in fact be unusual, because you might expect more "glue" between the elements in some situations. 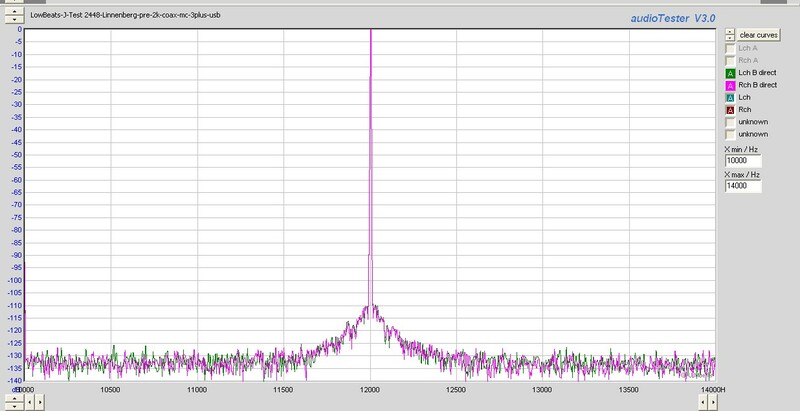 Regardless of the DAC the MC-3+USB rendered a slightly more vibrant and colorful sonic image: transients come across less aggressive, yet very fast and detailed. As a whole the playback seemed more natural, more relaxed, and with increased depth and transparency. 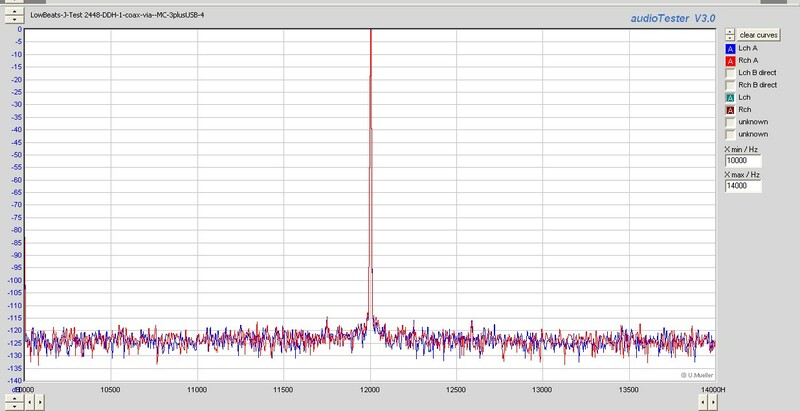 In the frequency domain there was a tad more energy in the upper bass response without actually muddying the sonic image. In comparison to its sibling the MC-3+USB did in fact deliver a slightly more delicate and more transparent sound quality. Even though the MC-3+USB is generally equipped with similar features as the MC-3+ we already reviewed, it elegantly caters to HiFi fans in particular. These users will also hardly be bothered by the fact that the device doesn’t allow recording simultaneously to the computer playback. The once again refined re-clocking technology will be the focus of most HiFi aficionados anyway, which is really something one can hardly live without after a few listening test. But the MC-3+USB also represent a kind of Swiss army knife for all sorts of applications in small mastering and project studios that wish for an extremely precise master clock. In summary then, MUTEC has created a universal tool with many benefits and exceptional sonic potential in the MC-3+ Smart Clock USB.